How to align a simple equatorial mounted telescope in the Southern Hemisphere. My old Sky Rover facing directly into the telescope, finderscope and red dot finder (which must all be aligned). f) the user's ability to find the selected objects. Succeeding only comes with practice and understanding. This article deals with the second and third of the above items (b & c), the two separate alignment procedures that are required with all telescopes using an equatorial mount. These are: (1) polar alignment and (2) finderscope alignment; and both should be carried out outside each time when setting up. Polar aligning means aligning the axis of rotation of the mount (not the telescope tube) to the South Celestial Pole (SCP). For general observing you will not need to be spot on but try to be within about five degrees to begin with and improve on this with experience. First set the latitude on the mount to the latitude of your location on the planet. If you live here in the Macarthur region, set it to 34 degrees. If you use the telescope at the same location, you will not need to change this setting again, provided you set up on flat ground each time. 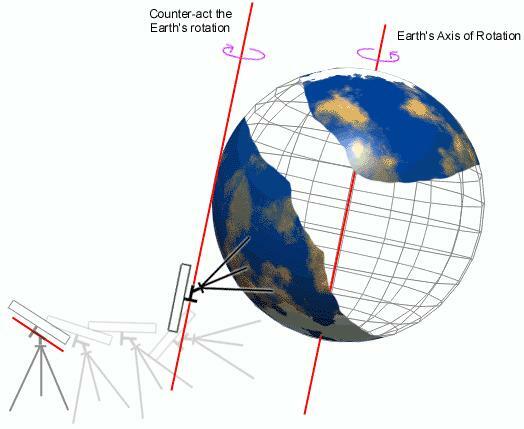 Once done, the RA axis (the fixed diagonal member on top of the mount to which the telescope and counterweight are attached) will point at an angle of 34 degrees above the horizon. You next need to aim the tripod and mount towards true south. A method of setting up the tripod to offset the mount from magnetic south to true south. Lift the whole assembly (telescope & tripod) and point the axis towards true south, using a good compass to find magnetic south and then aim the axis to point about 12.5 degrees to the East (left) of magnetic south. That will be true south here in Macarthur. So, in summary, if you are on level ground; with the tripod legs at even lengths; have the axis correctly set to 34 degrees; and the mount is pointing towards true south, then you will be aiming at the SCP, which is the point in the sky about which the stars appear to rotate every 23 hours 56 minutes. This means that if you manage to be fairly accurate with this polar alignment, then you will be able to track an object through the eyepiece using mainly the RA adjuster, with only occasional use of DEC adjustments. The reality is that it will take experience to be accurate - but the greater the level of polar inaccuracy, the more you will have to keep twiddling two knobs instead of just one to keep the object centred in the eyepiece. If you are a bit off, you will not be too inconvenienced by having to adjust the DEC knob once in a while. My old Sky Rover showing eyepiece, focuser, finderscope and illuminated Telrad finder. It is essential for finding objects that the centred view in the finderscope be aligned accurately with the view through the telescope eyepiece. After setting up in daylight, aim the telescope towards the most distant object you can see, perhaps a tv antenna a few streets away or a communications tower. Centre it and then, without jogging the telescope, look through the finderscope and use the finder adjustment screws to centre the same object in the finderscope. Then go back to the main scope to ensure it hasn't moved. If the finderscope and main telescope remain aligned, then once you have found a planet or other object in the finder, you are guaranteed to find it in your main field of view. By paying attention to these two vital alignment procedures you will enhance your viewing experience and avoid disappointment. "Irrational faith is feeding murderous intolerence throughout the world."